I was thinking of doing a weekly “What’s for Dinner Wednesday”. But, obviously it’s not Wednesday, and it took me weeks to finish my last post, so I will just stick with this one post and see what happens. So, with Dan traveling during the week Mon-Fri, Dinnertime with the kiddos (or even mealtime in general) can be a bit of a challenge getting everything ready. Sure, I could opt for pizza and frozen foods, but that’s not the kind of diet that I want me or my kids on. For lunch we typically alternate between pb&J and Turk&Ch along with carrot sticks and some sort of fruit. I eat the same, and I’ve been known to throw a salad or veggie crisps into the mix. When it comes time for dinner, I need something easy peasy. Parker is SO interested in helping me in the kitchen, that if it takes a long time, it’ll guarantee a meltdown or two. He loves to stir, so anything where stirring is involved, he’s a happy camper. Plus, he’s more apt to try it, if he’s helped cook it. See how that package says “SPINACH and cheese ravioli”? I’m sneaky eh? I like to get the veggies in where I can. I found these packages near the deli section at Kroger. 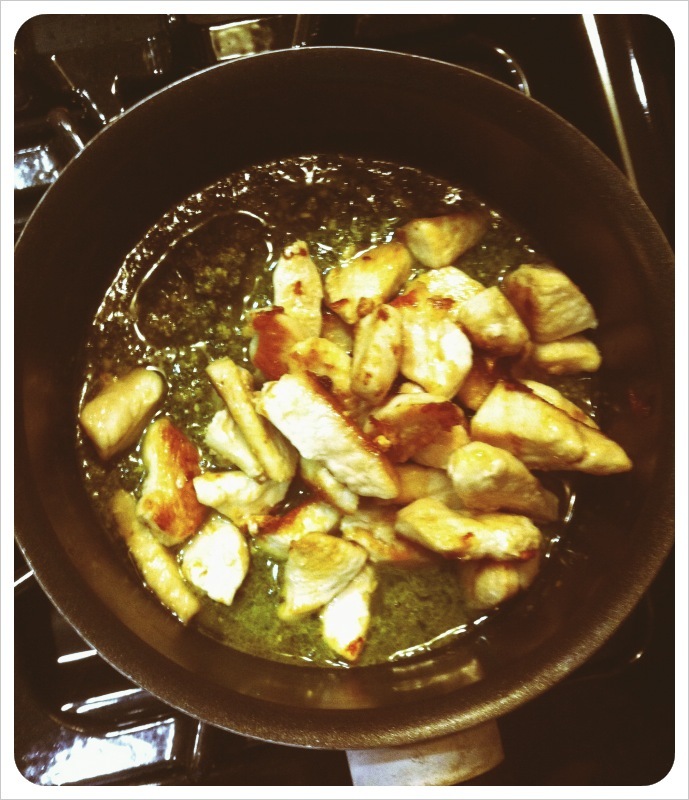 Yes, it’s a “prepared meal”…but it still takes some time to cook, and it’s not frozen. I’m not a fan of frozen prepared foods (except frozen fruits and veggies…and the occasional frozen pizza, I mean seriously…who can turn down pizza? Not me.) or even canned foods for that matter, so this was a good choice. Not to mention the big 3-4 mins written in large print on the package. That screams get in my cart right now! 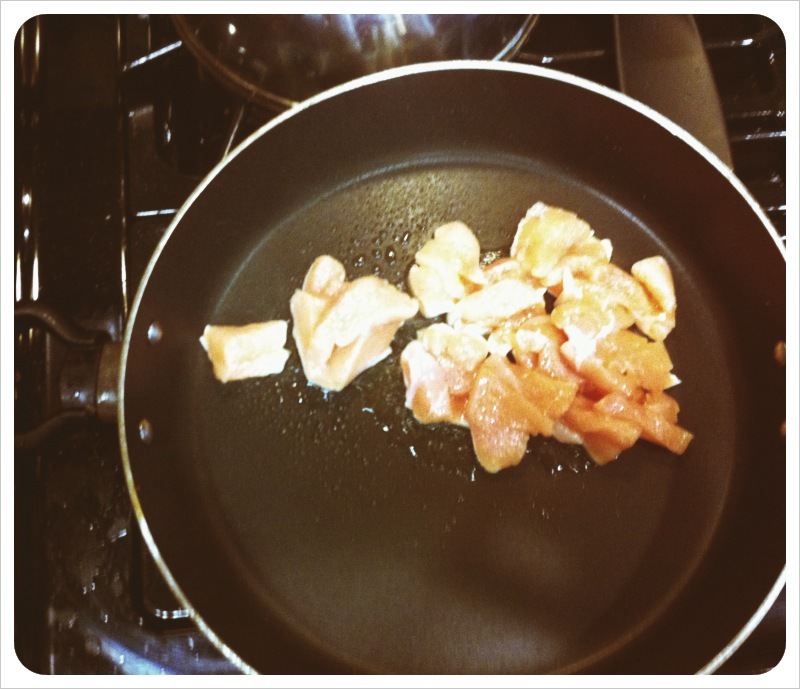 I started with cutting up the two chicken breasts into bite size pieces and placing in a pan with olive oil that had been warming and let cook for about 10 mins or so. 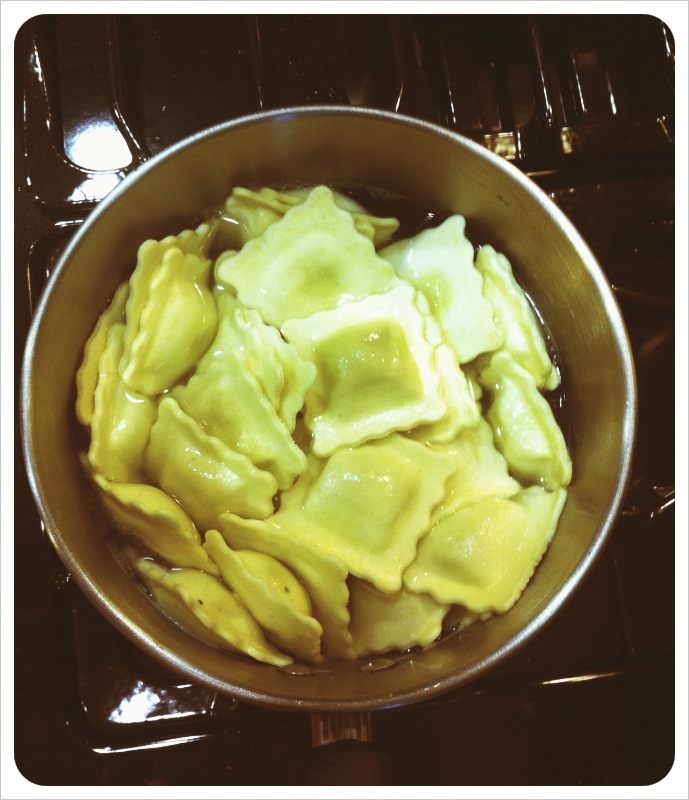 Then I started the water for the ravioli per the instructions and brought to a boil. Then placed the ravioli in the water to cook. Make sure to follow the instructions precisely because if it cooks too long the ravioli will explode and the spinach and cheese will come oosing out. Ask me how I know. 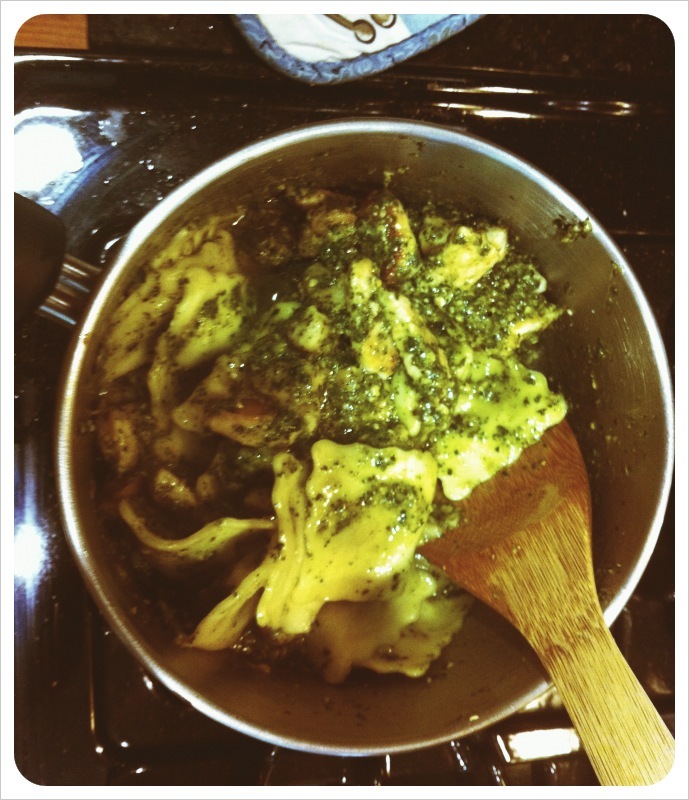 In the meantime, I simmer the pesto sauce (I added a little water since it was so pasty) and then added the cooked grilled chicken to the sauce while I waited for the ravioli to finish cooking. Then voilà! Combine with cooked pasta, and you’re done. Easy peasy right? The best part? It’s super YUM! Okay, so maybe it isn’t the best for your waistline, but it does hit a few of the food groups, and if the kiddos enjoy it, it’s an added bonus! Do you have any easy recipes that you can share? Grab my button and link up with me! I’d be interested in what other Moms do in the kitchen when there are needy kids to be watched at the same time. This looks so delicious! David works week nights, too..Dinnertime can be war! Thanks for the idea I will have to put it on the menu for next week! 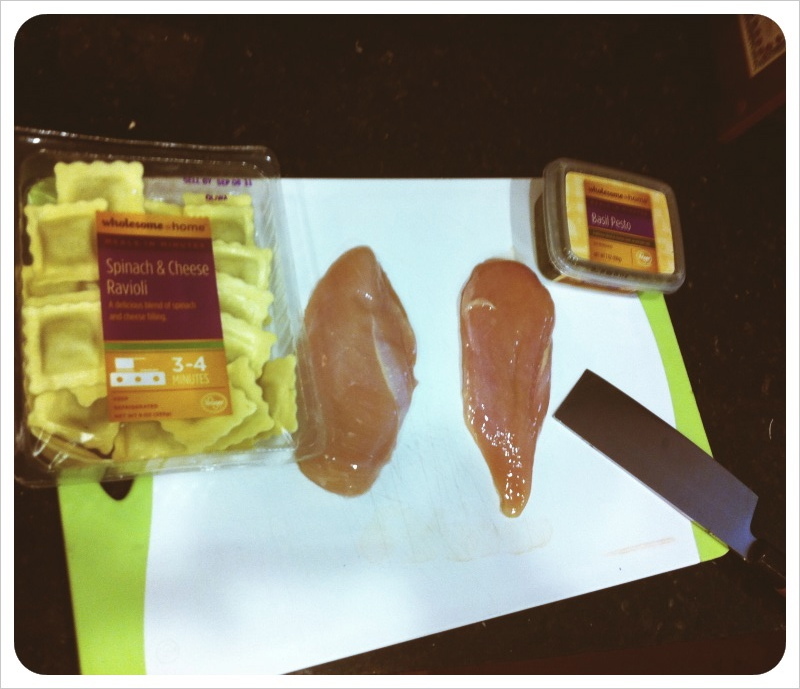 We do chicken alfredo a lot… Barilla Pasta makes noodles called “PLUS”…they are whole grain, have protein and omega 3..Try that if you haven’t already!